Surely you're aware of the monthly wine blogging extravaganza that is WineBloggingWednesday. However, you may be unaware of a little something called Combinations. It goes at the question of wine from a foodie perspective. The idea is to take a selected recipe each month and pair a wine to it. Andrew of Spittoon has hosted the first three editions of Combos. July's Combinations will take place right 'ere, so you best start practicing your wine & food pairing (announcement coming July 5). This recipe for June's Combos was selected by Eating Leeds. It's a middle-eastern themed dish - Flatbreads with Spiced Chicken, Pistachios & Roasted Peppers. The recipe includes a few tough-to-locate ingredients such as za'atar (a blend of sesame & sea salt & other herbs, depending on who you ask), sumac (!?) and Aleppo pepper (!!??). My take on this recipe was shaped by time (I realized on the day of the deadline that I had promised Andrew I would participate) and ingredient substitution (I sub'd Cayenne for Aleppo, neglected the sumac and mixed the creation with rice rather than slathering it over flatbread. But other than that, I followed the recipe exactly..). 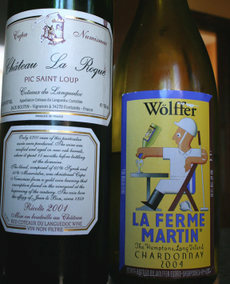 Rather than getting all Sommelier-y, I simply grabbed two open wines from the fridge (time constraints, you know); one a Chardonnay from Long Island (Wolffer "La Ferme Martin" 2004), the other a red blend from France's Languedoc (Chateau La Roque Pic Saint Loup "Cupa Numismae" 2001). Wolffer's wine (~$15) is a blend of steel tank-fermented Chardonnay (85%) and new oak-fermented Chardonnay (15%). It's rich and creamy with scents of ripe pear. The wine is medium-bodied, with noticeable vanilla flavor on the finish. Ch. La Roque (~$20) is a blend of Syrah and Mourvedre. It offers up earthy and herb-based scents mixed with a little spiced berry. The wine's acdity is noticeable in the mouth and makes "Cupa Numismae" seem more delicate than it actually is. So which wine paired best? Two components of the dish seemed to clash with the Chardonnay: the roasted red peppers and pistachios. After a sip of this white wine, the red pepper flavor turned strongly vegetal. The problem with the pistachios was more of a mouthfeel issues. The wine's slightly rich finish seemed to clash with the nut tannins. After one glass, I reserved the wine for post-dinner sipping. In this capacity, it was quite enjoyable. Interestingly enough, the two ingredients that fought with my Chardonnay, seemed to be at peace with my Syrah-Mourvedre blend. Cupe Numismae was spicy and bold enough to fend off the red peppers' vegetal advances. the end result was a sweet pepper flavor. Meanwhile, on the tannin front, the red wine's tannins appeared to trump the pistachio tannins. This led to pleasant nutty flavors that accented the overall spiciness of the dish (I went heavy on the Cayenne). The Combinations take-home message: Pic Saint Loup & Za'atar, good; Chardonnay & Za'atar, less-good. But, Chardonnay post-Za'atar, good. but judgin from your time constraint, it sounds like you did a delicious job! can't wait for your recipe, throw us a nice curve ball! Hi Jim - We'll certainly be taking advantage of Farmer's markets in the this month's Combos! Ann - Thanks for the spice shop tips. I just got a box with smoked sea salt...oh the possibilities!